“Jaxon’s autistic, so I think that makes him even cooler,” Amber Baumgard said. Jaxon Baumgard of Arvada, Colorado is five years old, and has been diagnosed with Ewing’s Sarcoma end stage. Saturday (September 29th) afternoon, the Baumgard family celebrated Halloween a month in advance because Jaxon is not expected to make it to October 31. The goal was to give Jaxon and his family a Halloween as soon as possible. Old Town Arvada would be the place. Silver Vines Winery shared their space for the event afterwards, participants donated more than $250 in cash to the family, and at least 50 lbs of candy was donated with extras being further donated to local children’s charities. The event was a resounding success, even down to the catering made possible by donations from Mike the Quad and Project-Nerd. Jaxon’s father, Zach Baumgard says this was an amazing day for his son. “If it was October 31st, I felt like it couldn’t have been any better than what it was today,” Zach said. Project-Nerd wants to personally thank the Project-Nerd Staff and Contributors that participated, Lon Davis of Walkin’ & Rollin’ Costumes, Silver Vines Winery, Bread Winners Cafe, the local 501st Mountain Garrison, Colorado Movie Cars, Colorado Ghostbusters, multiple businesses in Old Town Arvada that participated, and the many others that made this event possible for Jaxon and his family. Portions of this article are contributed by Denver 9 News. Lon Davis runs Walkin’ & Rollin’ Costumes. 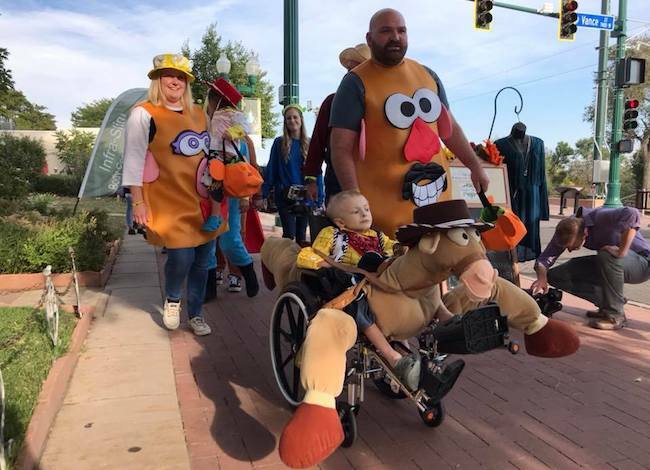 The company makes more than a dozen costume wheelchairs for children each year. There is currently a GoFundMe for Jaxon’s family established.